Are You Uncomfortable With the Losses You Might Have Incurred in October 2018? After the crash of 2008 – 2009, the stock market has been going up for 9 long years, one of the longest bull markets in history. However, in 2018 the market has been quite volatile after many years of very low volatility. So, as you get your brokerage statements with your October 2018 results, are you uncomfortable with the amount of money you might have lost? Did you lose $10,000, $30,000, $50,000 or even hundreds of thousands of dollars last month? Does that much risk disturb you? You might have called your broker when you got your October statement showing losses that made you uncomfortable, and he might have reassured you since then the market has gone up and you’ve made back some of your losses. However, the reality is that no one knows when bad months like October will lead to substantially worse months going forward. No one has a crystal ball. I met with a couple recently who thought that they didn’t mind market declines but when they lost years of built up tech stock gains in only one month in October, they realized that they really didn’t have the stomach for big losses at this point in their retired lives. We’ve all seen this movie before: sky-high real estate prices, sky-high stock prices and the Fed raising interest rates. And we know how this movie will end … we just don’t know when. That’s why retirees should be thinking about a managed money approach to investing … one designed to preserve and protect your wealth and leave a legacy to your loved ones. Now more than ever, it’s imperative for a retiree to practice money management if their goal is to preserve and protect their retirement assets. Many people lost a tremendous amount of money when the tech bubble burst and again when the real estate bubble burst, but the difference now is that my millionaire retired clients don’t have time on their side to weather another major downturn. Do you really have the stomach at this point for potential big losses again? Especially when you need to live on that money for the rest of your lives? My clients really don’t want any more surprises at this point in their lives. In this new world we find ourselves in, it’s vitally important to make sure that your retirement plan fits you. The right amount of risk, the right amount of diversification, and the right team watching your back. For over 25 years, we’ve been that team and we’re looking forward to working with you and your family as well. 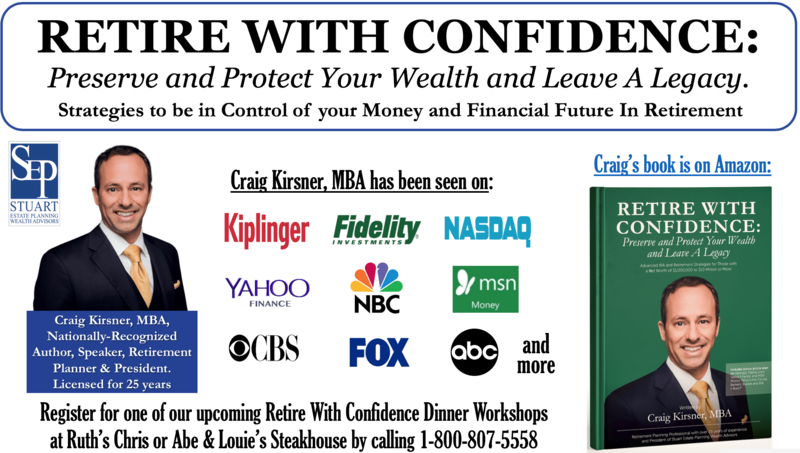 You can learn more by attending an upcoming complimentary dinner workshop at Ruth’s’ Chris or Abe & Louie’s Steakhouse in Boca Raton or Fort Lauderdale. This workshop is best suited for those over age 60 with between $500,000 to $10,000,000 or more in investable assets. Call our office to register now at 1-800-807-5558 or visit us at www.StuartPlanning.com.